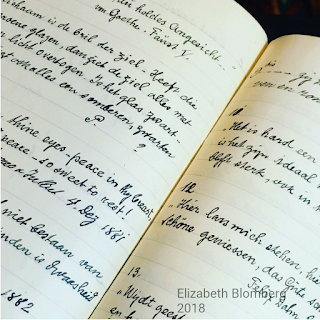 For the week 20 prompt - another language - I began by listing the languages spoken in my family tree. Several different languages appear, beginning with myself - Dutch and English. For my mother it is Dutch and some Malay, because she grew up in Java, Dutch East Indies, and this would be the same for my father. For both English appears as well and they would have learned this first at school and then later as adults because they lived and worked in English speaking countries. My mother also spoke German because her mother was German born. Dutch was the language of my paternal grandparents and add to that later some Malay because they lived and worked in the Dutch East Indies until 1946. Although I am not sure if Malay is the right word. Should it be Javanese, or Indonesian, I wonder? I'll leave it for now as I proceed up the family tree. For the week 19 prompt - Mother's Day I have chosen my paternal great-grandmother. 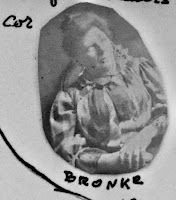 Johanna Cornelia Bronke and her family would not have known about Mother's Day. It was "invented" some 63 years after she was born in the Dutch town of Zaandijk, on 14th December 1851, daughter of Nicolaas Bronke and Aafje Wit. She was named after her father's mother, Johanna Cornelia van Outeren. Her paternal grandfather Herman Johann Kesseszn Kesse was born in Menslage, (near Osnabruck) Germany, and he adopted the name Bronke by notary deed, probably when surnames had to be registered by Napoleonic decree in 1811. He was a wine merchant and trader and his son Nicolaas Bronke was also a wine merchant and shop keeper. On the one tiny photograph I have of her, she is called Cor and I estimate she must have been in her mid forties when it was taken. I can see some family resemblance in the set of her mouth and eyes. She looks serious and determined.